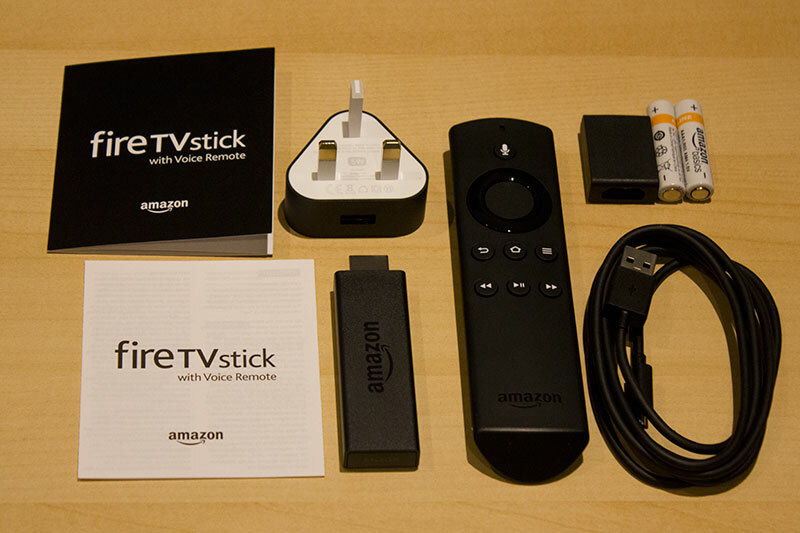 There are two products available, the Amazon Fire TV box and the Fire TV Stick. With these devices plugged into your television it gives users access to various online video and audio services. 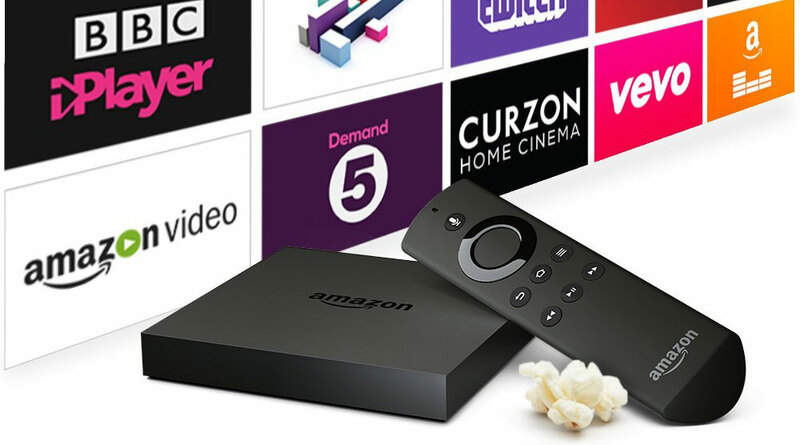 Users can stream movies from various services such as Amazon’s own Prime Instant Video (what used to be LoveFilm in the UK), Netflix and other catchup services. 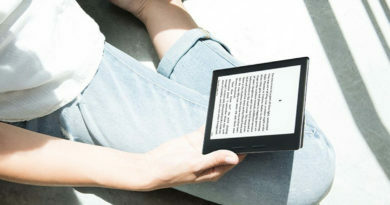 Streaming music is also catered for, including Amazon Music and Spotify Connect. 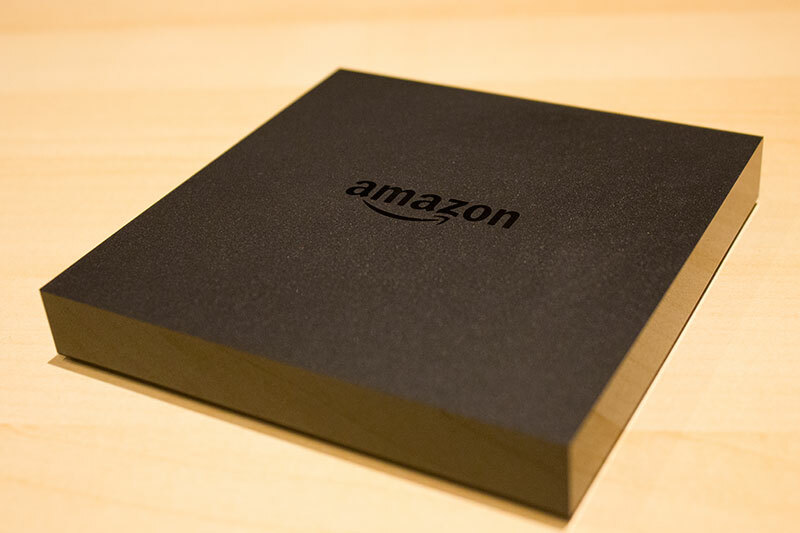 As one would expect, the Fire TV experience is closely coupled with the Amazon’s Prime service and you do need to have a subscription to this in order to use the Fire TV. If you already have an Amazon Prime account then you can have either product pre-configured to your account if you select the option when ordering. There are many downloadable apps, some are free others you need to pay for. Some of the major apps that would be of interest are Netflix (Netflix subscription required), BBC iPlayer, 5 On demand, YouTube and Spotify Connect. Notable absentee’s are 4 On Demand and ITV Player. The first key difference is that although both models show full HD 1080p video, the Fire TV can also display 4K Ultra HD with a compatible TV. The way they connect to your TV is also different. 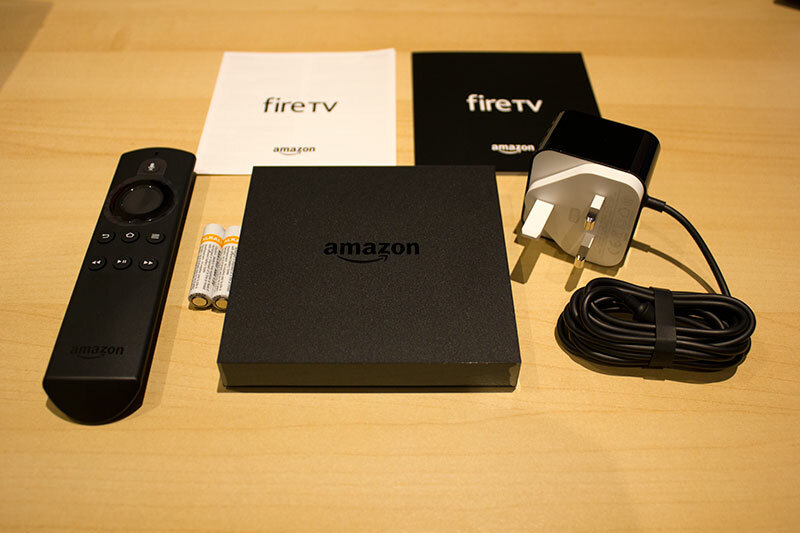 The Fire TV connects in a similar way to your dvd/blu ray player or your satellite box i.e via an HDMI lead. 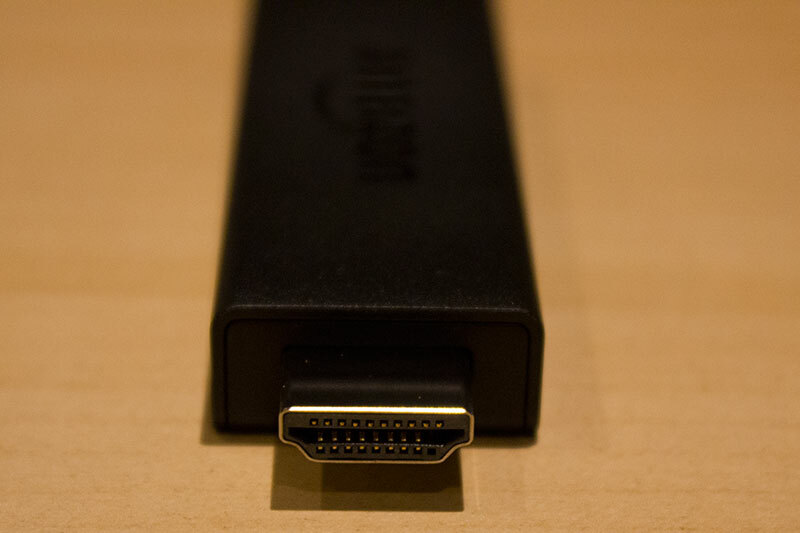 The Fire Stick is like a large USB dongle that connects directly into an HDMI port at the back of the TV, with an AC Adapter power lead connected to it. Bear in mind that if your TV is wall mounted and has rear facing HDMI ports, as opposed to downward facing, there may not be enough space behind the TV for the Fire Stick. Both devices have Wi-Fi using both the 2ghz and the faster 5ghz band. 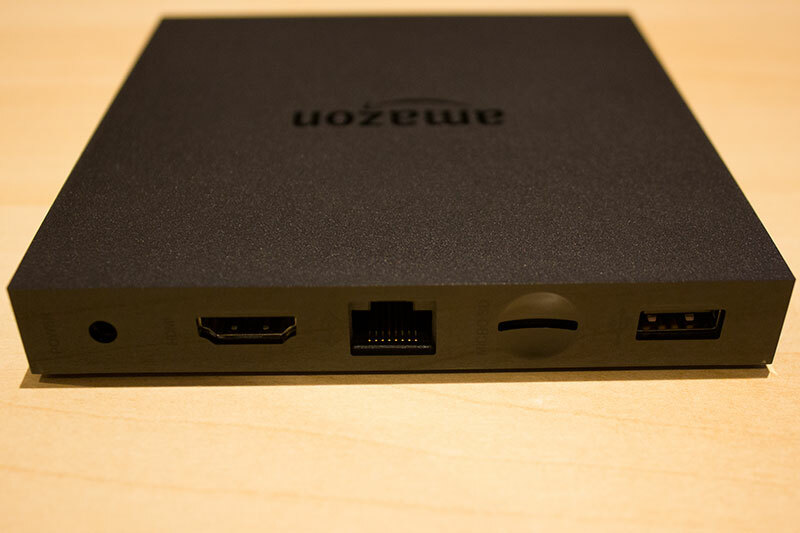 The Fire TV, being a box, also has an ethernet port for wired network connections. 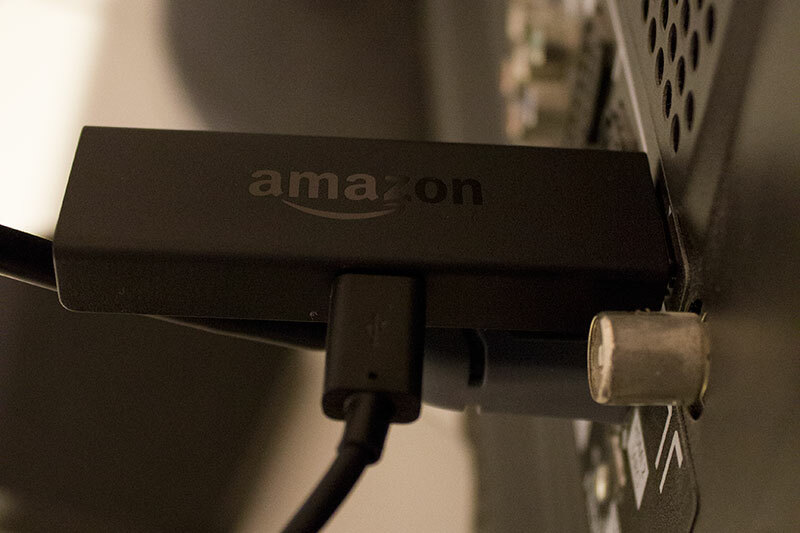 The Fire TV also has a USB port that can be used to add your own content and a MicroSD card slot to expand storage. The Fire TV is faster and has more memory than the Fire TV Stick, this is particularly beneficial with games, also some apps will only work on the Fire TV. Both have the voice-search remote but the Fire TV Stick is available without this remote for £10 less. The unit itself, which is a very slim box so it shouldn’t be too much trouble to find a space for it in the TV cabinet. The voice remote, with batteries supplied. Some quick start installation guides. Note. 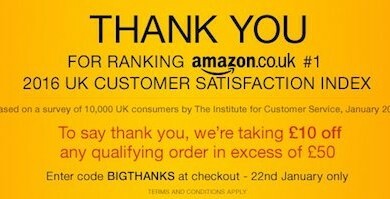 Amazon do not include an HDMI lead in the box, which is a shame, so please ensure one is ordered with the Fire TV or you have a spare one to hand. I personally ordered one with Fire TV and I was very pleased with the build quality. Installation is pretty simple, just a matter of connecting the HDMI lead to the TV, an ethernet cable between the box and your network, this is optional if you have Wi-Fi and the power lead to a socket. 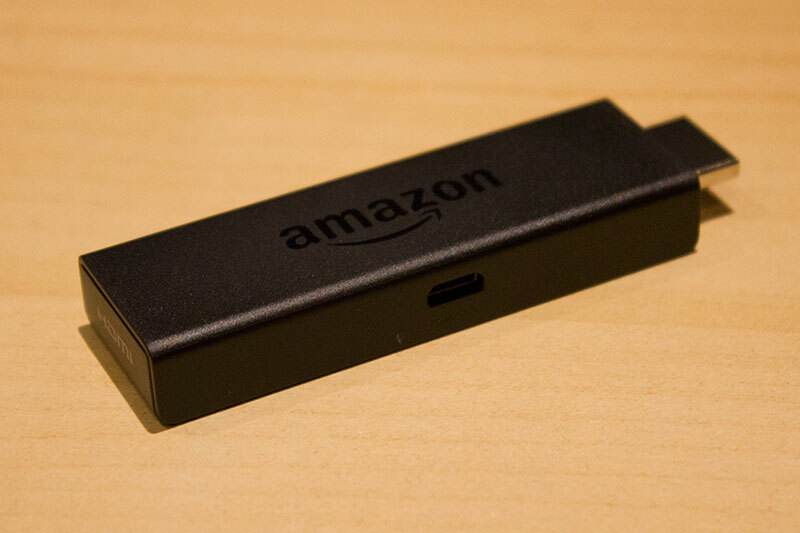 The Fire TV Stick dongle. 3-pin (UK) plug adapter with USB output. USB power cable to connect to plug. HDMI Cable coupler, this allows the stick to be placed elsewhere and connected to the TV via an HDMI Cable (not supplied). This might be useful if space is limited behind the TV. Voice Remote, with batteries supplied. Standard remote if you’ve chosen the cheaper version. Installing this is even simpler, plug the dongle into a free HDMI port at the rear of the TV and connect the USB power lead to it and into the plug and away you go. Setting up is the same for both devices, you have to pair your remote control up to the device first, this is fairly straight forward and the on screen instructions are very clear and easy to follow. All in all it took me a couple of mins to set up either device. Ensure you have your Wi-Fi password to hand if you plan to use Wi-Fi (no choice with the Stick). You will also need to sign into your Amazon Prime account, this will automatically enable Prime Instant Video and Prime Music. If you want to use Netflix there is a pre-installed app, but the YouTube app is one that you will have to download via the Apps menu. The same goes for the likes of BBC iPlayer and other catch up services. Both devices have pretty much the same functions except that there is a wider range of apps supported for the Fire TV. Amazon Instant Video is the primary streaming video source, the whole device and user interface layout is designed around this service. If you don’t have a subscription, and plan not to buy one, then do not buy this product. Other streaming services are available through the app store, including Netflix, BBC iPlayer, YouTube, Vimeo and many many more so there is plenty to keep you entertained. You can also stream your own video’s stored locally or on your network. 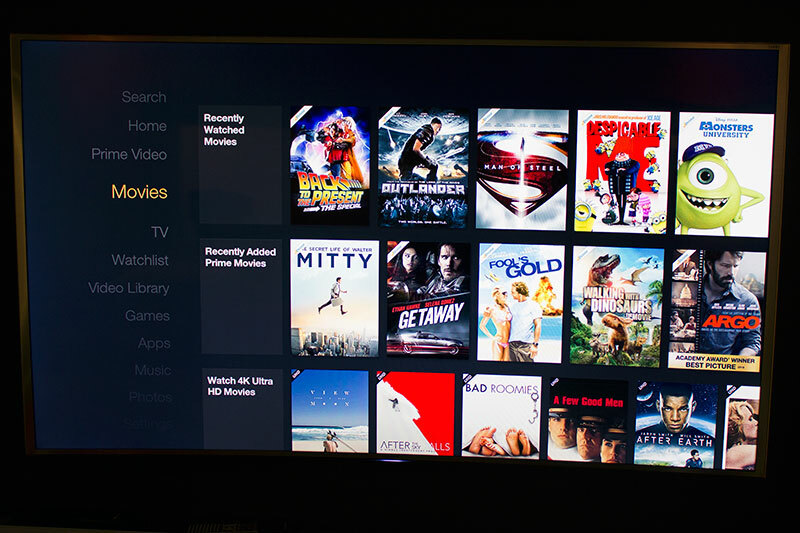 If you are an advanced user and have a Plex media server installed, then you can even access this by installing the Plex app. As mentioned before the Stick will not stream 4K, only up to Full HD 1080p, which currently is plenty enough because 4K content is still pretty sparse, or expensive to buy. Again here the main music source is Amazon Prime Music, the service is tightly integrated but there are other apps such as Spotify connect if you have other music streaming subscriptions. Amazon Prime music allows you to stream any music on their service plus any music you have bought from Amazon via digital download. There is no iTunes integration here so if all your music in on iTunes you’re out of luck here. You can also connect to your home network and play your own tracks if you have such facilities, this may also be a way around the lack of iTunes integration. You can do this by downloading your iTunes library to your Plex media server if you have one and stream via the Plex app for Fire TV. There is a fairly good catalogue of games that you can play on both devices although the more power hungry complex games will work better or only work on the Fire TV. Some are free and others are paid. Some popular titles such as Minecraft and Candy Crush are available. If you want to get slightly more serious with your games on the Fire TV there is Gamers pack which includes a proper gaming controller. Please bear in mind this is no Playstation 4 or Xbox One, but will suffice for very casual gamers who usually play games on their phones. You can mirror the screen from any Amazon Fire tablet device to the TV that’s connected to your Fire TV, much like how Apple’s AirPlay works. This allows you to watch pretty much everything you can watch from your mobile device on your TV. This is a good workaround if your favourite video streaming app isn’t available for the Fire TV. There are even apps that have been developed that allow AirPlay from Apple devices. 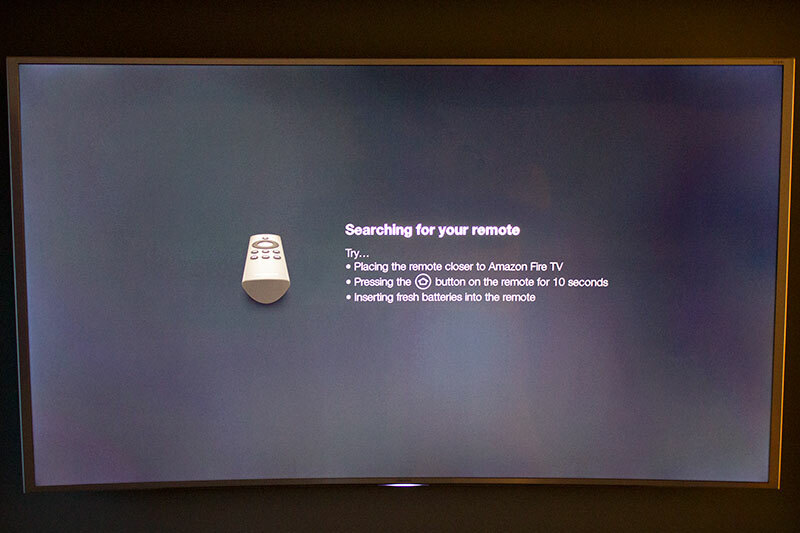 Amazon have integrated Alexa, their voice search assistant, into the latest Fire TV devices, this enables searching for titles by speaking into the remote control. You can search using simple terms such as the title of the movie you want to watch, or it is possible to perform more complex searches such as movies starring a particular actor/actress. Searching is currently restricted to within Amazon Prime services such as Instant Video. Hopefully Amazon will open up the search facility for app developers so Alexa will search within other apps such as Netflix as well. Alex is more than just a search facility for movies and music. You can ask Alexa for the weather, traffic updates, sports scores and even search wikipedia for a particular item. Alex is more like a personal assistant, and Amazon will be expanding what Alexa can do in future updates. I think this is an excellent feature, especially for those who find manually navigating through menus and apps more difficult or just a chore. I think both devices are excellent, they are easy to set up and use and include most of the core features one would expect from a streaming device. The fact that third parties can develop apps for the Fire TV is a great plus point because this greatly expands what can be done with these devices. If space is a premium and you are looking for a basic streaming device I suggest giving the Fire TV Stick a go. It doesn’t have all the bells and whistles but it does provide all the core essentials plus a bit more in an amazingly compact device. I would recommend the Fire TV for those who need a little bit more grunt and the 4K UHD streaming option, buying this device also allows you to add the gaming controller as an option. 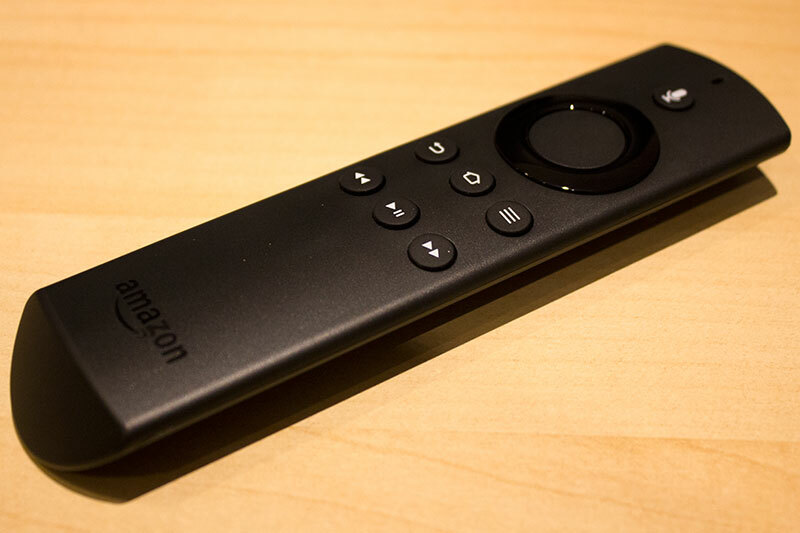 Overall I think that if all you want is Full HD streaming via Amazon Instant Video or any other service I would buy the Fire TV Stick simply due to the difference in price. I found that with HD streaming there was no difference in picture quality and performance between the two devices. The same also goes for streaming music. Something both devices do, and probably more so the Fire Stick is that they open more places where secondary TV’s can be placed in the house, for example the Fire TV Stick enabled me to use an older plasma television I had as a second television for the kids. I was able to set it up where it was much more convenient for myself and the kids but where no TV ports existed for Satellite or over the air aerial.